THE MAYBELLINE STORY : Advertising was the secret to Maybelline's success in the 1930's and still is today. 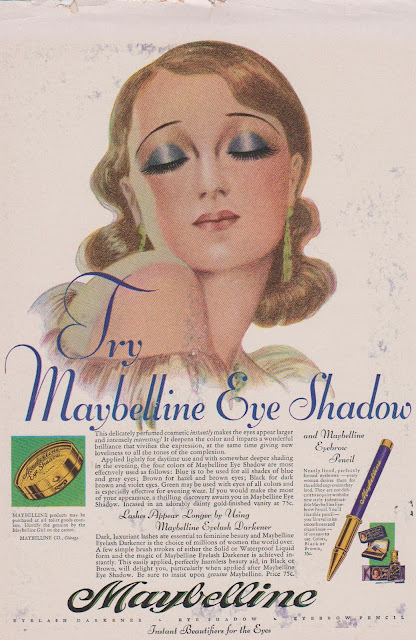 Advertising was the secret to Maybelline's success in the 1930's and still is today. When most companies were sinking 1n 1931 during the Great Depression Maybelline continued to endure. Tom Lyle concentrated on Advertising as the power head of Maybelline's expansion. He found that even during the worst economical times women spent money on Maybelline rather than putting meat on the table - just to have longer, darker more luxurious lashes. During Maybelline's Art Deco period, Tom Lyle used artist illustrations to produce sleek, modern, sophisticated images women emulated to appear as alluring as their favorite film stars. His instincts were right and that target market of independent woman carried Maybelline through the depths of financial insecurity to the heights of world success. Woman were hooked on glamour, style and beauty, refusing to ever be plain Jane's again. Even today when luxuries are tossed by the wayside to survive, cosmetics endure and steal the Lyon's share of the market. If you'd like to comment please do, I'd love to hear how your great grandmother, grandmother, mother and even yourself and daughter can relate to what Tom Lyle did to bring women out of the shadows and into the light of confidence and Panache.